Pink Paper: It can be seen flying above the Cabinet Office, adjacent to Downing Street: the centre of government dealings. Deputy Prime Minister Nick Clegg, who in an interview this week reiterated his support of gay marriage. AP: Nick Clegg has hailed the start of a "new era of pride" as the rainbow flag was raised in Whitehall for the first time. 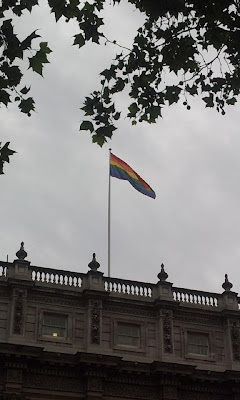 The Deputy Prime Minister said flying the flag, a symbol of lesbian, gay, bisexual and transgender pride, to coincide with London's gay pride event this weekend was a "small but important emblem". It comes after Mr Clegg called on Thursday for churches and other religious premises to be allowed to host gay weddings.